ROBERT SOUTHCOMB. The first certain information we have about Robert is his marriage in Rose Ash in 1693. We have no record of Robert’s birth or baptism. His marriage in 1693 makes it likely that he was born in the 1660s, shortly after the Restoration of the Stuart monarchy. Examination of Southcombe wills makes it probable that his father was Anthony Southcombe, son of Robert Southcombe, gentleman of Mariansleigh. His mother was Grace Holway of East Buckland, six miles to the north. Anthony was living there by 1664 and jointly paying Hearth Tax on a large house with Grace’s father, John Holway. It is likely that this is where Robert was born. He probably grew up in the same house as his grandfather as well as his parents. We do not have any information about his maternal grandmother. Robert’s father was descended from a line of gentleman, but one of his uncles is recorded in his will as ‘Robert Southcombe, yeoman of Bishops Nympton’. We do not know Anthony’s social status. His will has not survived, only a note of when it was proved, which lists him simply as ‘Anthony Southcombe of East Buckland’. He may have been either a gentleman or a yeoman. Robert’s uncle John appears to have been the eldest son. It was easy for younger sons to slip down the social and economic scale. Still, the family were living in a house with five hearths, which was one of the four largest in the parish, even if they did share it with Grace’s father. We can assume Robert grew up in a well-to-do home. The Southcombs of Rose Ash were strongly Royalist. It is possible the Mariansleigh and East Buckland Southcombes were too. If so, they would have rejoiced at the crowning of Charles II. But the Civil War had caused deep splits in the community. North Devon, heavily dependent on its wool trade, was one of the strongest areas in the county for loyalty to Parliament. If the Southcombes were known to have been Royalists, there may have been some lingering resentment against them, but by 1660, most people had tired of the strictly Puritan government. In 1672, Robert was mentioned in the will of his grandfather, Robert Southcombe of Mariansleigh. We do not know what form the legacy took. In 1685, he benefited again from the will of his uncle Robert, yeoman of Bishop Nympton. By then, he was probably a young man around twenty. MARY ZEAL’s origins are also clouded by the loss of early registers. At her marriage in 1693 she was said to be a spinster of Rose Ash, but her baptism has not been found there. This could mean that she was born before 1660, when there is a gap in the registers. That would make her over 33 when she married. This would be older than usual, but 34 or 35 would still fall just within the range of normality. However, there is no record of a Zeal couple having children when the register resumes in 1660. Again, Mary could have been one of the last children in her family. On balance, it seems more likely that she was born in a nearby parish in the 1660s. The most likely place is Mariansleigh, where there are no 17th century registers, apart from occasional Bishop’s Transcripts. Her surname does appear in Rose Ash earlier that century. It is sometimes recorded as ‘Eymes alias Zeale’ or ‘Zeal als Eames’. Henry Eame alias Zeale was a yeoman from Bishops Nympton. In 1616 he leased part of Rose Ash Barton, in the centre of the village, from George Smith of Hadworthy, knight. The lease was for 99 years or 2 lives. The lives were those of Henry and his intended wife Grace Snell. Henry and Grace had 3 children baptised in Rose Ash between 1617 and 1622. One of their sons, Henry or John, could be Mary’s father. In 1618 Anthonie Zeale alias Emes married Johanna, daughter of John ffuyn. John ffuyn was another of our ancestors. An Anthonie Zeale also had children baptised in Rose Ash between 1634 and 1637. If this was the same man, there were probably other children born earlier outside Rose Ash. One of them could be an alternative for Mary’s father. The naming evidence suggests that Henry and Grace are likely grandparents. Robert and Mary called their last son Henry. Henry is not a common name among the Southcombes, but was current among the Zeales. This makes no mention of either party being from another parish and we should normally assume that both were parishioners of Rose Ash. Nor does the marriage register say that they were married by licence. But the list of marriage licences issued in the Exeter Diocese shows that they were. It also gives additional information. ‘Marly’ is Mariansleigh, bordering Rose Ash to the west. Unfortunately, the accompanying Marriage Allegation, which might have told us still more, is missing. Even so, this is valuable information. W.H. Wilkin, who made a detailed study of the Southcombs of Rose Ash, believed that Robert was one of this branch, descended from George Southcomb, gent, who came to the village with his young family in 1587. Wilkin thought the most likely parents were John Southcomb and Julian Crocker, and that Robert must have been born before 1660, during the Commonwealth following the Civil War. There is a gap in the Rose Ash registers for this period. We do know from their wills that John and Julian had a son John born then. But there is no mention in either of their wills of a son Robert, and our Robert did not use the names John or Julian for any of his three sons and two daughters. The evidence is far more convincing that Robert, husband of Mary Zeal, was descended from an older Robert Southcombe, the brother of George of Rose Ash. Two wills from this family mention Anthony Southcombe and his son Robert, who would have been about the right age for Mary’s husband. Anthony’s wife was Grace Holway. Robert and Mary named one of their sons Anthony and a daughter Grace. This line of the family was mainly based in Mariansleigh,. The information from the marriage licence that Mary Zeale’s bridegroom came from Mariansleigh gives added weight to this identification. Robert and Mary’s wedding is likely to have been conducted by the Rev Lewis Southcomb (‘Lewis the Third’), who was Robert’s third cousin. In 1675 he had become the first Southcomb rector of Rose Ash, following the death of Roger Trosse, the Royalist rector who regained the living after the Restoration in 1660. He began a remarkable succession of eight generations of Southcomb rectors of Rose Ash, which lasted from 1675-1948. The last rector had an only son, who was killed in the First World War in 1917. The Rose Ash Southcombs were not only Royalists, but particularly loyal to the Stuart family. When James II was deposed in 1689, his daughter Mary and her husband William of Orange became joint monarchs. Mary II was a Stuart, daughter of the deposed James II, but her husband was not. Following his accession, the Rev Lewis Southcomb became a ‘non-juror’ and refused to sign the oath of allegiance to William. Mary’s was not the only Zeale wedding in Rose Ash in the 1690s. There were marriages there for William Zeale of Bishops Nympton in 1691 and John Zeale in 1694, but neither of these raised their families in Rose Ash. 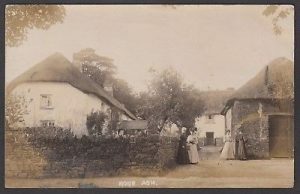 Henry Zeale, on the other hand, married outside Rose Ash, but returned to live in the village and had his children baptised there between 1693 and 1698. Any of these three could be Mary’s brothers, but Henry is particularly likely. His name would continue a family pattern, and makes the second of these three Henry Zeales the most probable father for Mary. yeoman farmers. They were part of a social group which included the Southcombs, Zeales, Loosemores and Vicaries. Theirs was not the only Southcomb-Zeal marriage that century. In 1607, Lewes Southcomb, grandfather of the first Southcomb rector of Rose Ash, had married Margaret Eyme alias Seale in Bishops Nympton. In Rose Ash, only the Southcombs seem to be classed as gentry, and not all of them. Robert was not one. The Rose Ash Southcombs were the local squirearchy. They were patrons of the living as well as rectors. But there were too few people of gentlefolk status in this locality for them to form an exclusive society. Whether gentry or yeomen, these families intermarried and their names are found together on property deeds and wills. We can assume they maintained close social contact with each other. Robert and Mary settled in Rose Ash and had five children there. None of their children seems to have died in infancy. In 1616, Henry Eame alias Zeale, who was probably Mary’s grandfather, had taken out a lease for part of Rose Ash Barton when he married Grace Snell. They shared the property with John Tanner. Exactly a century later, in 1716, there was a dispute between John Tanner and Alicia Zeale alias Eames over the topping and lopping of certain pollarded trees on Rose Ash Barton. This shows that the Zeale family was still occupying part of that same farm. Alicia could well be Mary’s mother or aunt. The document details the ownership of various parts of this farm. Another later occupant of Rose Ash Barton was Nicholas Loosemore. In 1718, either he or his son married the Southcomb’s eldest daughter Mary. In 1713, Robert Southcombe and Nicholas Loosemore were Overseers of the Poor for Rose Ash. They took up a case in which a legacy had not been paid. Citation of Elizabeth wife of John Gould, junr exrix of will of Richard Pincombe, late of Rose Ash, decd to answer Nicholas Loosemore & Robert Southcombe supervisors of the poor of Roseash in a cause of subtraction of legacy. Probably Richard Pincombe had left money to be given to the poor of the parish. What the citation does not say is that other beneficiaries whose legacies had not been paid were Robert’s own children. Richard Pincombe had left them £2.10 each, a not inconsiderable sum. We do not know what relation there was between the Pincombes and the Southcombes. Robert’s father, Anthony Southcombe of East Buckland, died in 1715. We do not know the provisions of his will, but it is likely that Robert and Mary benefited from it. In 1718, the Southcombes’ daughter Mary married Nicholas Loosemore’s son, Nicholas the younger. The following year, Mary Loosemore and her brother, Robert junior, again took up the case of their unpaid legacies. Mary senior died in 1721. From now on, the picture becomes confused by the presence of Robert and Mary’s son Robert, born in 1696, and by his fourth cousin, Robert, son of John Southcombe, born in 1688. Both were now grown men, and the records do not usually distinguish between them. In 1727, a Robert Southcomb married Mary Stafford, but this is more likely to have been one of the younger men than a remarriage for the widower of Mary. In Bishops Nympton, there was another Lewis Southcomb, a yeoman and probably another third cousin of Robert. In his will, dated 1728, he mentions Robert Southcomb, ‘the clerk of Rose Ash’. It is not clear whether ‘clerk’ in this case means clergyman or parish clerk. We know that our ancestor Thomas Nichols, the carpenter, was parish clerk of Rose Ash from at least 1731 and possibly as early as 1727. It could be that one of these several Robert Southcombs in the village was his predecessor. A number of the Rose Ash Southcombs were in Holy Orders. The Southcombs were not only rectors and patrons of Rose Ash, but of other livings besides. They sometimes appointed a Southcomb to the church at Kings Nympton, so that they would have a reserve ready to be transferred to Rose Ash when the incumbent there died. Robert Southcomb, clerk, could have been a curate serving under Lewis. The burial of Robert Southcomb, husband of Mary, has not been found. A number of burials for Southcombs of this line are missing from the parishes where we might have expected to find them, even where registers exist. It is possible that they were taken back to Mariansleigh, to be buried at the ancestral church and that they are in the lost parish register. Robert and Mary’s’ third son Henry died in middle age in 1748. He was said to be ‘of Wood’, a farm which has not been identified. This may perhaps have been Robert’s farm earlier. Henry’s younger sister Grace died three years later, still unmarried. She was said to be ‘the sister of the late Henry Southcomb, of Wood’. This reference to a brother, not usually found in the burial register, suggests that Henry was of significant social standing in the community.